San Francisco, due to its close proximity to Palo Alto (home of Google, Facebook, and Apple, to name a few) is on the cutting edge of technology. But walking around the hilly city you'd be hard pressed to know it. The wide streets are lined with quaint, colourful Victorian houses, the cable cars look like they belong in a black and white film, and, most surprising, everyone is in a really good mood. 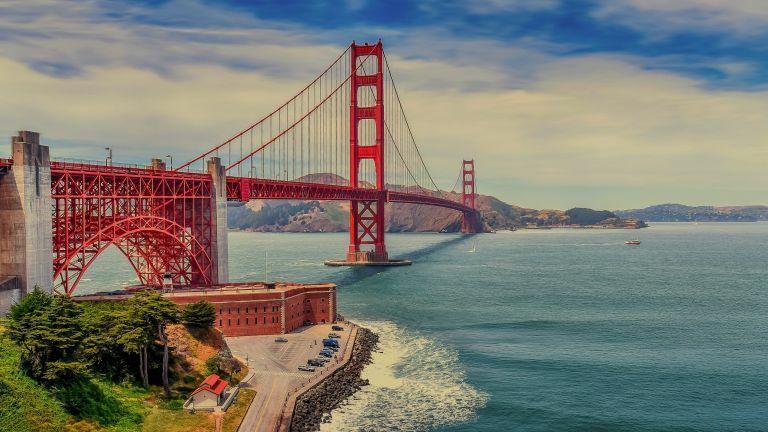 San Fran is known for its year-round fog, iconic Golden Gate Bridge, and the notorious Alcatraz Island. It's a small city (by American standards), but if you have a limited amount of time, say, 24 hours, it can be difficult to squeeze everything in. We think the best way to see San Francisco is by bike, but not just any bike, you'll need an electric bike. You see, it's nicknamed the Hilly City for a reason – even Tour de France cyclists would struggle getting up some of these steep inclines. We rented our bikes from The New Wheel shop. New Wheel are different from your regular bike shop. Their mission statement is, "to not only to change how we get around, but to bring good things and fresh ideas into the lives of people in our community and California as a whole". They offer one or two day rentals (from $90/day), and offer top of the line e-bikes. We rode the Riese & Müller Delite (From $ 6,049), powered by Bosch's electric motor and battery system. The electric motor supplemented my pedal power (with four levels of assistance), rather than being able to coast along on electric power alone, but the 23-mile route would have been impossible without these e-bikes (for me, anyway). If an electric bike sounds like too much hard work for you, a one-day pass for public transport costs $22. Of course, there's also Uber, if even the thought of an electric bike is making you sweaty and out of breath. Starting from The New Wheel bike shop head straight towards the bay for a brisk cycle along the waterfront. Follow the water's edge, past AT&T Park (where the San Francisco Giants play) and Pier 39 (where you might like to stop off to spot some sea lions). Soon you'll come to Fort Mason and Black Point, where you'll have clear views of Alcatraz. If you only have one day in SF, we'd suggest you skip boarding a ferry and visiting the former prison, as this can take up at least half a day. Instead, continue to cycle along the coastal path until you reach the Golden Gate Bridge. Stop off at the 'Warming Hut' for refreshments (the hot chocolate was very nice), take a few pictures, then continue your cycle up the hill towards the Golden Gate Overlook. This will be the first true test of the bike – unassisted cyclists (much fitter then us) were dropping like flies while we rode to the top without breaking a sweat. Continue along the coast to the Legion of Honour Art Museum, then through the Golden Gate Park and into the Outerlands restaurant, on Judah Street, for lunch. Outerlands is a local, organic restaurant, which is dedicated to supporting its environment. We started with the Split Pea Soup, feasted on an open-faced meatloaf sandwich for the entree, then finished with a homemade doughnut. Feeling a little more lethargic, head towards the Pacific Ocean for a leisurely ride along Ocean Beach. Then begin the cycle towards Twin Peaks, two towering hills with an elevation of around 282m. The two hills are the second highest in San Fran, offering amazing 360-degree panoramic views of the city below. Again, climbing these hills was easy thanks to the electric bikes, although, it's wise to eye on the battery meter – you wouldn't want to cycle up here unassisted. Head back to New Wheel's shops to drop off the bikes (it's mostly downhill from here), then choose from the below activities for the evening. Scoma's: Serving Pacific seafood, caught on small boats, and brought to their pier by local fishermen, Scoma's is steeped in local history. The restaurant offers a full bar program with premium crafted cocktails and an extensive award-winning wine list to complement your meal. If you plan on driving, there is free valet service at our door. Harris' Steakhouse: Harris' Restaurant has served the finest midwestern beef available on the West Coast for nearly a century. Executive Chef Michael Buhagiar has created our award winning menu, which offers a wide selection of aged beef including our signature dry-aged Porterhouse and Harris’ bone-in New York steaks. Finish your dinner with Pastry Chef Alana Wind's classic and seasonal desserts. Comstock Saloon: Named after Henry Comstock and the famed Comstock Lode, which brought mining fortunes to the City by the Bay, Comstock Saloon occupies a historic space that has served as a watering hole for San Franciscans since 1907 (that's a long time in the USA). Comstock Saloon offers patrons refined turn-of-the-century saloon fare, an assortment of snacks, and a menu of classic cocktails in a setting that preserves the saloon’s historic design elements and pays tribute to San Francisco’s Barbary Coast. Make sure your try the “Afternoon Delight”, a cocktail inspired by none other than Elon Musk. than you'll find at the front bar. Anchor Brewing: Anchor is America’s first and oldest craft brewery, with roots dating back to the California gold rush. Today it's beers are handmade from an all-malt mash in a traditional copper brewhouse. The process combines the time-honored art of classical craft brewing with carefully applied, state-of-the-art modern methods. If you're into beer take the brewery tour, you'll think you've died and gone to heaven. If you're thinking of staying in San Francisco longer than 24 hours you must take a cable car, spending some time to take in the Victorian architecture you've been tearing past on a bike. You could also board a ferry to Alcatraz and tour the infamous prison island. Alcatraz Cruises offer several tour options of varying length and guidance. If you've had enough of the city, and would like to experience nature, just a few miles north of the Golden Gate Bridge you'll find Muir Woods National Monument. It's the closest place to San Francisco where visitors can see coastal redwood trees, the tallest of which would tower 22.5 metres above the Statue of Liberty. Finally, if you're a self-respecting tech fan, a visit to Palo Alto (Silicon Valley), is a must. Have brunch at the Mayfield Bakery, then marvel at the huge headquarters of Google, Facebook, and Apple.